Tesco is one of the world’s largest retailers with a team of over 460,000 colleagues in ten markets dedicated to serving shoppers a little better every day in our stores and online. One of our core values is: “Every little help makes a big difference.” It captures how, when we add up all the small things Tesco colleagues do and our broader commitments, we can make a big difference to the issues customers, colleagues, communities, and wider society care about. WHY IS TESCO MEASURING FOOD LOSS AND WASTE (FLW)? At Tesco we have no time for waste, and we believe it is wrong that when one in nine people—almost 1 billion people globally—go to sleep hungry that around a third of total food production is wasted. In 2013 we announced our ambition to lead on reducing food waste globally and made a straightforward commitment that by the end of 2017, no food that is safe for human consumption will be wasted inside the Tesco United Kingdom (UK) retail operation. Our customers and colleagues care about reducing food waste. Food waste results in significant costs to our business, as well as our suppliers and our customers. We can reduce our environmental impact since food waste puts unnecessary pressure on land and natural resources and results in additional greenhouse gas emissions. The power of reporting and analyzing our food waste data is that it allows us to find out where waste is occurring and develop plans to tackle it. WHAT HAS BEEN YOUR EXPERIENCE WITH USING THE FLW STANDARD? Having previously calculated our own operations food waste data and documented our methodology, we found reporting our data in conformance with the FLW Standard to be a straightforward process. The table below shows how we meet the requirements of the standard. The standard is a powerful tool that provides not only the rules but also guidance on what to measure and how to measure it. Using the FLW Standard allows us to report in a more consistent manner and make clear what has and has not been considered food waste. As another benefit, reading the guidance in the standard has given us ideas for aspects to consider as we continually improve our data gathering and reporting process. WHAT CHALLENGES IN MEASURING FOOD LOSS AND WASTE HAVE YOU ENCOUNTERED AND HOW DID YOU OVERCOME THEM? The main challenge we faced was around identifying a suitable method for calculating our food waste data. We have developed and refined a robust “bottom-up” methodology, which covers 93 percent of the wasted products (by weight) from our own operations. The details of this are described in the methodology we post publicly on the Tesco website. By way of example, for our retail waste, we combined the number of units scanned as expired or damaged with the weight of individual product’s contents. This approach automatically excludes packaging and allows Tesco to generate a breakdown of total food waste down to the individual product level. WHAT ACTION HAS TESCO TAKEN AS A RESULT OF MEASURING ITS FOOD LOSS AND WASTE? In March 2016, we made a straightforward commitment: By the end of 2017, no food that is safe for human consumption will be wasted inside our UK retail operations. 16,391 tonnes went to anaerobic digestion and energy recovery. The 16,391 tonnes of food going to anaerobic digestion and energy recovery is the gap we need to close to meet our commitment. As noted above, one way we will meet our target is through Community Food Connection. This is a program delivered in partnership with food redistribution charity FareShare and social enterprise FoodCloud that connects Tesco stores to local charities and community groups, enabling us to redistribute food that’s left over at the end of the day to people in need. Stores use the FoodCloud app to let local charities and community groups know how much surplus food they have for donation at the end of the day. Charities respond to a text message to confirm they will collect the food, and come and collect it free of charge. As of August 2017, Community Food Connection is now live in over 1,900 Tesco stores, including all 806 “large stores.” So far, we are working with over 5,800 charity partners and have donated the equivalent of over 11 million meals to people in need. Community Food Connection will be rolled out to all UK stores by the end of 2017. Furthermore, as the platform is available for others to use and is smartphone compatible, we believe this is a solution that can be used by the whole industry, with the potential to change the face of food redistribution. WHAT IS INCLUDED IN THE SCOPE OF THIS FLW INVENTORY? The following figure visually represents the scope of Tesco’s current food waste inventory (2016/2017) for stores and depots in the UK using the. While multiple destinations fall under the definition of “food waste” for Tesco, food waste in this inventory only goes to the two marked with a green check: anaerobic digestion or controlled combustion (with energy recovery). Tesco has achieved zero food waste direct to landfill since 2009. HOW DOES THIS INVENTORY MEET THE FLW STANDARD’S REQUIREMENTS? The table below provides a summary of how this FLW inventory meets the eight reporting and accounting requirements contained in the FLW Standard. Relevance: Data informs waste reduction activities. Completeness: All stores and depots are included. Consistency: Use same methodology each year; significant changes are back-casted. Transparency: Methodology, including assumptions, is published. Accuracy: Calculation is externally verified; ongoing work to reduce uncertainties. 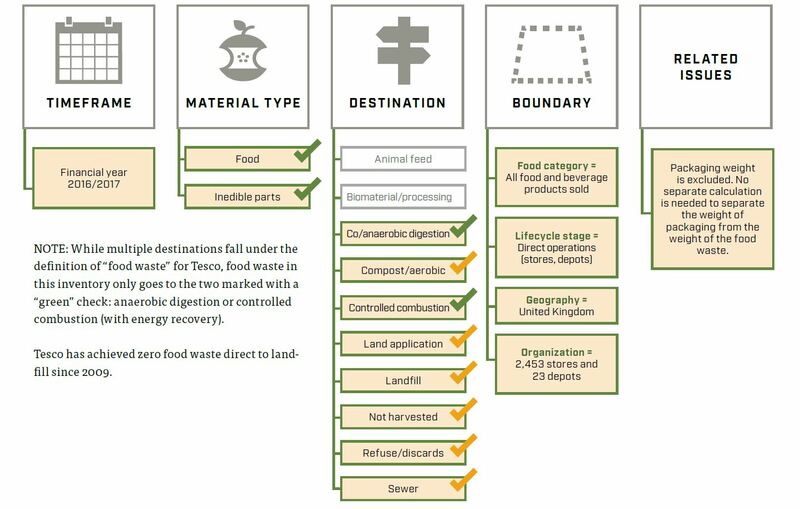 Destinations: While multiple destinations fall under the definition of “food waste” for Tesco, food waste in this inventory only goes to anaerobic digestion or controlled combustion (with energy recovery). Related issues: Packaging weight is excluded. No separate calculation is needed to separate the weight of packaging from the weight of the food waste, since the product weights used to calculate the total weight do not include packaging. Additional details about the scope are published here. Existing retail and depot data sets. Methodology is published on Tesco’s website. This case study was submitted by Mark Little (Tesco) and Tecla Castella (Anthesis Consulting), with input and review by Liz Goodwin, Craig Hanson, JP Leous, and Kai Robertson (representatives of WRI), as well as FLW Protocol Steering Committee member Richard Swannell (WRAP). The Food Loss & Waste Protocol (FLW Protocol)—a multi-stakeholder partnership— has developed the global Food Loss and Waste Accounting and Reporting Standard for quantifying food and/or associated inedible parts removed from the food supply chain—commonly referred to as “food loss and waste” (FLW). World Resources Institute (WRI) serves as the FLW Protocol’s secretariat. For questions, please contact flwprotocol@wri.org.